SQA Exams & Study Club – During the week beginning 1st April study club around 50 pupils took part in three days of Study Club. All pupils in S4, S5 and S6 get the chance for some extra tuition from teachers over the holiday specifically to help with the national exams that begin in May. S4-S6 pupils have also been issued with information relating to their exams. Pupils should be using their action plans and revision materials for each subject to help in their preparation for these. The school timetable, detailing exact times and locations of exams, is being finalised and will be issued at the beginning of next term. Higher Modern Studies Pupil Conference – On Saturday the 23rd of March, our Higher Modern Studies pupils and Ms Velt traveled to Culloden Academy to attend a Higher Pupil conference. Our pupils attended various lecture on exam topics. They also received expert advice from exam markers and from the principal assessor who is in charge of administering the exams. The main aim of the conference was to help the pupils gain confidence in their essay writing skills and raise achievement. Despite the fact that this Higher qualification is seen as very challenging, the uptake of the subject and the attainment levels have risen remarkably in recent years throughout Highland region. Our pupils should be commended for giving up their Saturday and showing such impressive commitment to their studies. 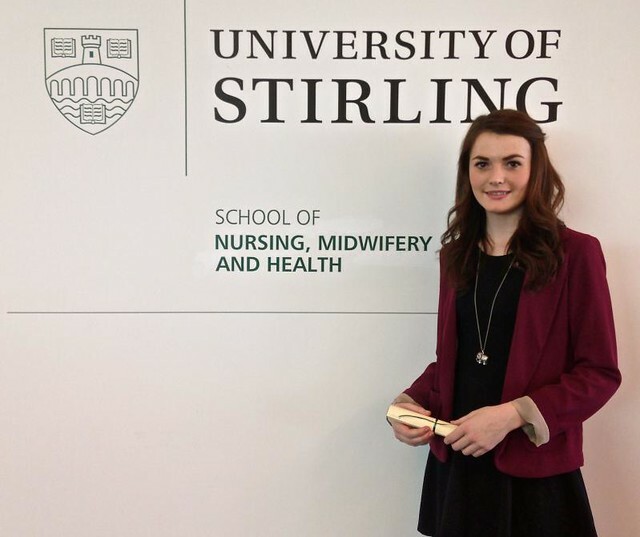 Pupil Success – Jasmine Easby, S6, graduated from the University of Stirling Pre-Nursing Scholarship Program recently. The course started last summer with a residential week and has been on-going part-time since then. The program is intended to inspire future nurses whilst developing employability core skills for work in the Health Sector. It is an Intermediate 2 course, run by the University of Stirling. Jasmine was 1 of 12 people out of the highlands to be chosen for this program. Well-done Jasmine! Mother Courage – The Library was packed out for the moving, impressive and utterly believable performance of Mother Courage by the GHS drama group on International Women’s Day (Fri 8th March). The cast was dealing with mature themes, exploring and celebrating relationships between mothers and daughters for this occasion. The audience of around fifty (including 2 or 3 men) seemed spellbound and you could see a tear in many eyes as they experienced the drama. 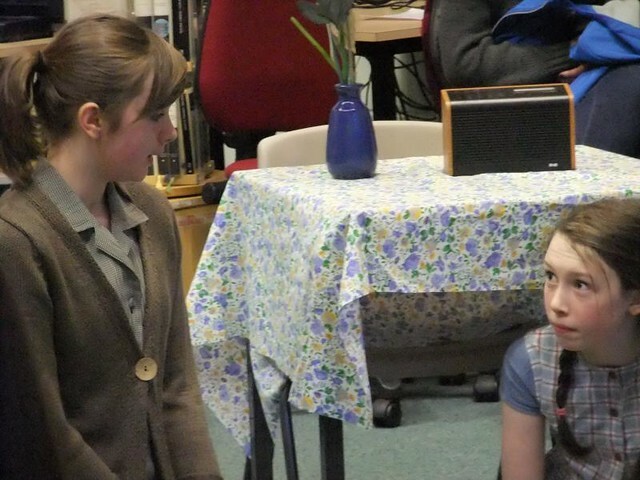 Members of Flumgummery Youth Theatre also showed their skills with a pre-play poetry recital. The event raised £73 for ROSA a UK based charity championing women’s rights and opportunities. Thanks to Helen Peat and Kirsty Thistlethwaite and the group of performers for their commitment and the time they put into this play. Five-star front of the house input came from GHS Hospitality pupils under Kirsty’s guidance. The pupils’ baking was complemented all around as was their professional appearance. Thanks again to all involved. See the school website for more photographs. Swimming Gala – Sixty-one pupils took part in the annual school swimming gala on Tuesday 26th March. There were impressive performances from our swimmers, and some very close races. Everyone who entered a race earned points for their house, and double points were on offer for those making it through to the finals. Maree had more participants on the day and with dominance in all the relay races, they won comfortably with 271 points. Tollaidh and Kerry battled it out for 2nd and 3rd place and there were only a couple of points in it all morning. Eventually, Tollaidh took second place with 167 points and Kerry were in 3rd with 164. Well done to all who took part and thank you to the staff who helped with the judging, scoring and crowd control duties. Seonaid kindly agreed to come into school to talk to my class S3 Design and Manufacture class and other pupils who are interested in design and engineering. She gave a detailed talk and PowerPoint about her current work. She designs products that make dairy cows produce more milk. The product monitors the stomachs of cows for acidity and this helps keep them in good health, As part of the visit we held a design competition to see who could create the tallest tower to hold a hard-boiled egg. It was very enjoyable and I would like to say thank you to Seonaid for coming to make her presentation. You can read Seonaid’s work profile by clicking on the link and scrolling down the page. Basketball – Congratulations to the boys’ basketball team, who came back from a ten point deficit in the second quarter to win 71-49 at Inverness Royal Academy on Tuesday 26thMarch. The boys involved were Nick Stein, Sandy Garrioch, Callum & Gregor Vickerstaff, Peter Banks, Ross Wotherspoon, Luke & Jordan Gorman, Jake MacDonald, Innis Taylor and Joe Smith. On the last day of term, over fifty pupils formed seven basketball teams and played in a tournament that lasted the length of the day. It was great to see S1-S6 all playing together. Results will follow in the next issue. Well done Callum Vickerstaff for organising the tournament and Rachel and Ainslie for timekeeping and scoring. Important Dates – Saturday 6th April at 7.30pm. 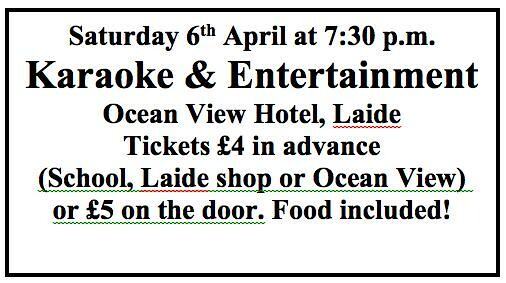 Karaoke & Entertainment at Ocean View Hotel, Laide Tickets £4 in advance (Laide shop or Ocean View) or £5 on the door. Food included! School re-opens for all on Monday 15th April.